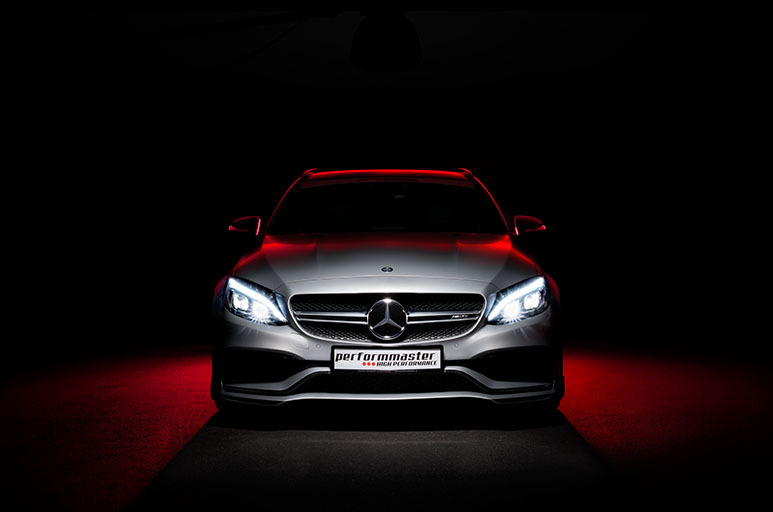 performmaster high performance is now also dedicated to the exterior of your Mercedes AMG. Under the label performmaster: AERSPHERE, we developed a high-quality aerodynamic package especially for the AMG GT series. The performmaster AERSPHERE AMG aerodynamics package ensures that maximum efficiency can be achieved at the same time as maximum driving dynamics. Especially at higher speeds increases the proportion that affects the wind load of your Mercedes-AMG. As the driving speed increases, the forces acting on the body of your Mercedes-AMG increase. The performmaster AERSPHERE AMG aerodynamics package improves airflow and optimizes traction for a better feel on the front axle and a more sporty rear axle. The result: improved handling and pure driving pleasure with the performmaster AERSPHERE AMG aerodynamics package. Optimized aerodynamics are indispensable for your Mercedes-AMG GT, GTS & GTC for dynamic and, above all, safe driving. With the efficient performmaster AERSPHERE AMG aerodynamic package, the desire for higher cornering speeds, better acceleration and optimum handling is realized. All aerodynamic optimizations improve and stabilize the handling of your Mercedes-AMG – especially at higher speeds. The performmaster AERSPHERE AMG aerodynamics package, consisting of front flaps for Mercedes-AMG GT, GTS and GTC and rear wings for Mercedes-AMG GT and GTS Coupe, significantly improves significant congestion, friction and suction forces on the vehicle body and the rear of your Mercedes-AMG. With our front flaps, we ensure a seamless transition at the vehicle front and achieve a more even flow around the vehicle here. At the rear, the performmaster AERSPHERE rear wing contributes to a balanced counter-swing while minimizing stalling. The interaction between the performmaster AMG rear wing and the performmaster front flaps optimizes the air flow – for perfect downforce at the rear and targeted negative pressure on the vehicle floor towards the road. The performmaster AERSPHERE AMG aerodynamics package noticeably improves the driving characteristics of your Mercedes-AMG. Both the AMG rear wing and the front flaps have a positive effect on driving stability and lower the noise level in the interior. Better handling and more stable handling even at higher speeds with the performmaster AMG aerodynamics package. The performmaster AERSPHERE front flaps contribute significantly to optimizing the aerodynamics of your Mercedes-AMG. The front flaps smooth the front of the vehicle and are mounted almost seamlessly and flush. The front flaps for your Mercedes AMG provide more downforce on the front axle and thus a higher driving stability with more precise steering behavior to be able to move the AMG GT, GT S or GT C even more sporty. The design was chosen so that the performmaster AERSPHERE Front Flaps fit seamlessly into the existing front apron and complete it. They make the AMG GT look deeper. performmaster AERSPHERE has deliberately opted for a design line that fits elegantly into the overall picture and is also functional. On request, the performmaster AERSPHERE AMG front flaps are painted in body color or are available in black high gloss (Night package). Especially at higher speeds on straights and cornering, the positive effect of the performmaster AERSPHERE rear wing makes itself felt for your Mercedes-AMG. The rear wing significantly optimizes the demolition edges at the rear of the Mercedes-AMG and allows the air to disappear almost turbulently to the rear. Due to the stall on the rear wing, the trailing area behind your Mercedes-AMG is significantly reduced. In addition, the power of the air is directed to the rear wing, which significantly improves driving stability and handling, especially at higher speeds. On request, the performmaster AERSPHERE rear wing are painted in body color or are available in black high gloss (Night package). Less lift on the rear axle and a significant reduction in pressure losses and turbulence. The performmaster AMG rear wing impresses with a high degree of accuracy for your Mercedes-AMG. The assembly takes place at the original mounting points for Mercedes-AMG GT and Mercedes-AMG GTS. The AMG rear wing is made in Germany, has a low weight thanks to glass fiber reinforced plastic. The high-quality workmanship ensures a high mechanical load capacity. The performmaster AMG rear wing blends seamlessly with the vehicle aesthetics of Mercedes-AMG GT and Mercedes-AMG GTS. Improved aerodynamics for your Mercedes-AMG by reducing the lift on the front axle and reducing pressure losses at the front. The performaster AMG front flaps are fastened with a high degree of accuracy and at the original attachment points for Mercedes-AMG GT, Mercedes-AMG GTS and Mercedes-AMG GTC. The AMG front flaps are made of glass fiber reinforced plastic and are characterized by their high mechanical strength – despite lightweight construction. This guarantees the high-quality processing Made in Germany by performmaster. The Aroedynamik Front Flaps were in perfect harmony with the vehicle design of Mercedes-AMG GT, Mercedes-AMG GTS and Mercedes-AMG GTC.